Your new 5 Plus VJ's Gino Quillamor, Bea Benedicto, Ariana Conechado, Jodie Tarasek, Kim Cruz and RJ Arroyo. Looks like 5 Plus is amping up it’s roster of talents as your go to sports channel does more esports and gaming content this 2019. One of em is called The Nationals (esports franchise league) and consequently, it is being hosted by pro esports casters while you’re watching bringing blow by blow accounts when it happens in the network. The DOTA 2 games will be done by Sam Nopueto, Aries Alejandro, Neil de Guzman, Jaz Comoda and Rain Manaig. The Tekken bouts will be done by Ron Muyot, Poch Estrada, Paul Fuentes and Pica Lozano. For those who still love Mobile Legends, you won’t be alone with Manjean Faldas, Shin Boo Ponferrada, Gian Bernardino, Em Dangla and Lhea Lei Pelaez. During The Nationals, they will all be joined by regular casters Eileein Shi, Alyzza Taylor, Mika Fabella, Tonie Moreno and Dan Cabungay. They’ll also be telling their back stories, game highlights so you get to know the players, how they got there and their success stories. 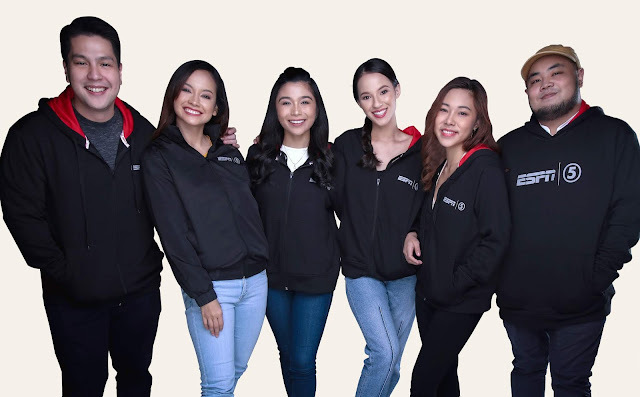 6 new VJ’s will be joining 5 Plus this month as Gino Quillamor, Bea Benedicto, Kim Cruz, Jodie Tarasek, Ariana Conechado and RJ Arroyo (usual suspects in VJ work, modeling and other industries) will also be joining the 5 Plus frontline. They’re ready to rally the biggest events and gaming coverages so you get informed at the comforts of your home. The Nationals will be aired Tuesdays and Wednesdays from 4pm to 7pm. It also airs Saturdays and Sundays 10am to 1pm. Catch them all on 5Plus!